I can't believe I am posting this. 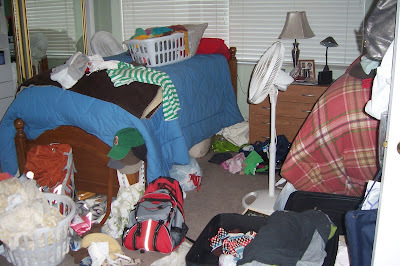 I even more can't believe that my room really looked like this. I don't think my room has ever been this big of a mess in my whole life. I have been living out of a suitcase for the past month and a half. I basically dumped my suitcase in the washer when I got home and dumped the clothes back in my suitcase for the next trip. I am happy to say all my laundry and the suitcases have been put away. Wow. Impressive, I dont think I have ever seen anything of yours get messy. Not even your handwritting! What would your momma say?! It's okay- big messes mean you've been having big fun! This looks like your room when you were growing up. Just kidding!!! !